A Single Shot Can End The War. From Academy Award-winning director Clint Eastwood (Million Dollar Baby, Unforgiven) comes the World War II epic Flags Of Our Fathers, produced by Eastwood, Academy Award winner Steven Spielberg (Saving Private Ryan, Schindler's List), and Rob Lorenz (Mystic River). $10.245 million on 1876 screens. While I don�t know if I�d call the image of Marines as they raise the US flag on Iwo Jima the most iconic photo of all-time, it sure must qualify high on that list. 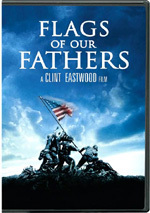 Clint Eastwood uses 2006�s Flags Of Our Fathers to show us the story behind the famous picture. Flags mostly focuses on three soldiers involved in the event. We meet Navy corpsman Doc Bradley (Ryan Phillippe) and Marines Ira Hayes (Adam Beach) and Rene Gagnon (Jesse Bradford). The movie takes a non-linear approach to events. It looks at the battle between the Allies and the Japanese on Iwo Jima as well as the iconic flag-raising itself. In addition, much of Flags concentrates on the aftereffects of the photo. Of all those involved with the photo, only Bradley, Hayes and Gagnon survive. The US government sees propaganda value in these men and uses them to sell war bonds. They tour the US and deal with psychological and practical issues created by their experiences. I must admit I find Eastwood to be overrated as a filmmaker. Don�t interpret that to mean I think he�s bad or untalented, as neither is true. However, I don�t see that most of his work deserves the praise it receives. Of his two Best Picture winners, 1992�s Unforgiven stands as the strongest, but it remains flawed. Though it features many strengths, it comes with too many problems to stand as a great flick. However, Unforgiven significantly betters 2004�s deeply problematic Million Dollar Baby. Trite, predictable, simple and heavy-handed, that movie didn�t remotely deserve its success. One could argue Eastwood won for Baby as a �make good� for 2003�s Mystic River; many felt that flick should�ve won over actual victor The Lord of the Rings: The Return of the King. I wouldn�t argue that, as I loved King and thought River was just pretty good, but it seems like a plausible explanation for the otherwise mystifying awarded issued to Baby. I suppose it may come as some form of poetic justice that Flags stands as one of Eastwood�s best films but it won�t win the Best Picture prize. That�s because it wasn�t nominated; instead, Letters from Iwo Jima - the Japanese-centered flipside of Flags - got the Best Picture nod. Since I�ve not yet seen Letters, I don�t know if I think the Academy made a mistake, but I do know that I like Flags. Moving, rich and satisfying, Flags stands as top-notch Eastwood. I�ll admit that part of the reason I like Flags comes from the subject matter. I�ve always been interested in World War II history, so that sort of material almost always connects with me. However, my enjoyment of WWII-based flicks is far from inevitable. I�ve seen plenty of bad movies that follow that era - Windtalkers, anyone? � and can probably find more poor WWII movies than good ones. In truth, Flags is less about the war and more about its aftermath. In that vein, it somewhat resembles 1946�s The Best Years of Our Lives. Unlike that overrated melodrama, however, Flags manages to dig into its subjects well. Eastwood�s flick balances its non-linear narrative in a surprisingly coherent manner. The film jumps from warfare to flag raising to subsequent events with ease and confidence. Never does the story confuse or befuddle as it skips from one area to another. Though Flags gives us a good picture of the thread leads, Hayes creates the most memorable participant. He�s easily the most complex personality of the bunch. An American Indian, Hayes confronts racism both subtle and overt, and he also deals with the worst �survivor�s guilt� of the trio. This leads to alcoholism, self-loathing and problems that don�t face the other two. Unfortunately, Flags doesn�t develop Gagnon and Bradley as well. Even though the movie is based on a book co-authored by the real Bradley�s son, �Doc� comes across as a thin sketch of a personality. We never get much of a feel for the man above and beyond his devotion to his fellow soldiers. Perhaps the involvement of Bradley�s son is part of the problem; this may have sucked some of the depth out of �Doc� since his son may have been too reverential. Whatever the case, the movie suffers a little from the absence of depth given to �Doc�. The film�s development of Gagnon falls somewhere between those two extremes. Rene comes across as easily the slickest and most opportunistic of the trio. He views the bond-selling tour as a chance to make a fine life for himself, while Bradley and especially Hayes are considerably less comfortable with the way they�re forced to turn the pain of war into propaganda. Gagnon doesn�t seem to care and often seems like something of a jerk. The movie manages to develop him better as it progresses, though I don�t think it ever quite makes him a three-dimensional personality. Despite some of these concerns, I think Flags works well. The film�s unusual focus has a lot to do with this. Most war movies don�t spend much time off the field of battle, but here we clearly see the unique circumstances that involved our leads and how these situations affected them. Much of the film does take place on Iwo Jima, but the concentration on the subsequent bond drive adds real depth to the story. Flags easily could have been a simple depiction of the story behind the famous flag raising, but the psychological view of the post-battle events makes it something more. Eastwood balances the elements well and never allows one to dominate. He melds the material into a slightly inconsistent but mostly rich and involving tale. 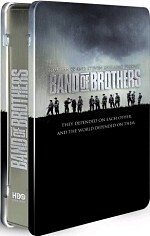 Flags of Our Fathers appears in an aspect ratio of approximately 2.35:1 on this single-sided, double-layered DVD; the image has been enhanced for 16X9 televisions. Across the board this was a terrific transfer. No issues with sharpness emerged. At all times, the movie seemed crisp and detailed, as I detected no signs of softness. I found no edge enhancement or shimmering, but edges occasionally seemed a little ropy. No source flaws emerged at any point. Most of Flags went with a severely subdued palette. The Iwo Jima scenes looked nearly black and white, as they consistently seemed desaturated and colorless. The shots back in the US were a little brighter and included some reasonably lush reds when necessary, but the visual design kept things flat. Within those constraints, the tones looked appropriate. Blacks were deep and full, while shadows seemed clear and concise. Overall, the movie presented excellent visuals. Along the same lines, the Dolby Digital 5.1 soundtrack of Flags worked exceedingly well. The soundfield proved involving and effective. Unsurprisingly, battle sequences offered the most active sections. They used all five channels well to integrate the viewer into the warfare. Elements meshed together smoothly and created a broad, seamless environment. Music showed good stereo imaging as well, and speech was accurately localized. Audio quality seemed positive. Speech was concise and natural, with no edginess or other problems. Music sounded lively and bright, while effects were well reproduced. Those elements sounded accurate and tight, with good, deep bass response. No problems emerged during this excellent soundtrack. Flags comes almost totally devoid of extras. The DVD opens with a few ads, as we get promos for Letters from Iwo Jima and Babel. And that�s all she wrote! I know Eastwood doesn�t do commentaries, but it seems strange that we get nothing at all to support the movie. Heck, the DVD doesn�t even offer a chapter menu! At least Flags of Our Fathers ends up as one of Clint Eastwood�s strongest movies. Indeed, it�s one of his few efforts that really connects with me. Flags tells a rich story in a clear, nuanced manner that makes it satisfying. The DVD presents excellent picture and audio but lacks extras. Despite that disappointing aspect of the package, this is a strong movie that merits your attention.